This is feature is highly recommended to use to efficiently set your device for the first time. However, the feature is optional. 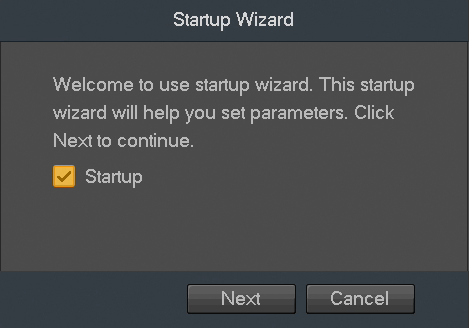 To cancel startup wizard, press Cancel. If you wish to proceed with the startup wizard, click Next. Note: To have the wizard appear during initial startup of your device, click on the checkbox option next to Startup. The first screen that appears in the startup wizard will be the General menu. This menu allows you to set the name for your device as well as provides several general options associated with your device. Once set, click Apply and then the Next button to continue. Device No. Number of analog channels supported. Language Which language your DVR is operating under. Instant Play Set to play back the previous five minutes to sixty minutes of playback video. Navigation Bar Check if you want to enable Navigation bar on the live view screen. Startup Wizard Check if you want the startup wizard to appear upon startup. Mouse Sensitivity Sets the sensitivity of your mouse controls. 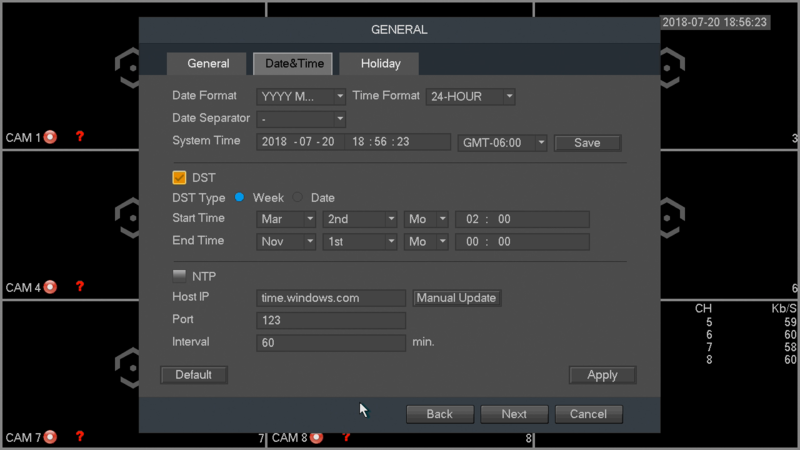 The next screen that appears will be the Date & Time settings screen. This is where you can set the date and time for your specific location. If you wish to utilize daylight savings time, check the DST check box. Once you have selected the proper date and time for your device, click Apply and then the Next button to continue. Note: Make sure to toggle the NTP toggle switch to the off position to avoid syncing your device to the NTP server. The next screen that will appear is the Network settings screen. 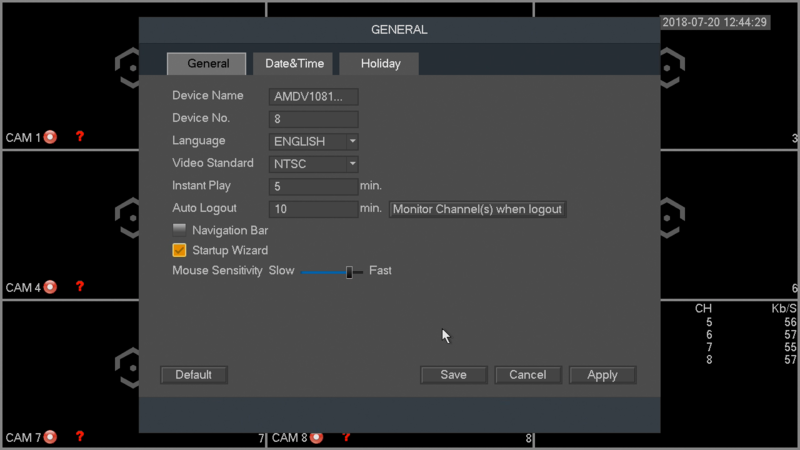 In this screen you can configure the network settings for your DVR. If you want to set your device up to have a static IP (recommended), select the STATIC radio button next to DHCP. 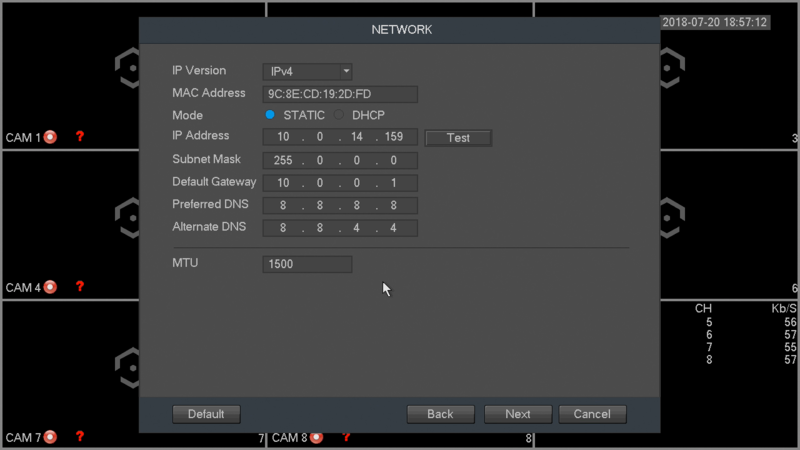 Note: To test the connectivity of the device to your network, click on the Test button. The device will return a network status. To return to the previous menu, click the Back button. The next screen that appears is the P2P settings screen. This will be enabled by default. It is highly recommended to keep this enabled if you want to use you’re the Amcrest View Pro mobile app or AmcrestView.com to view your cameras remotely. After enabling the P2P toggle switch, click the Next button to continue. 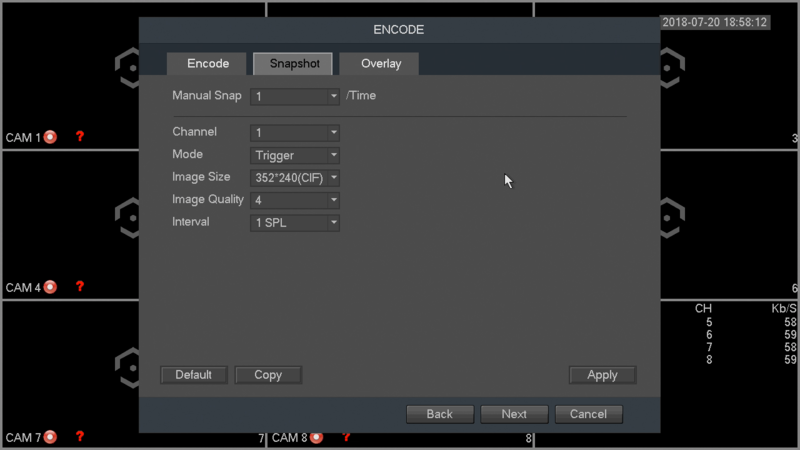 The next screen that appears is the ENCODE settings screen. 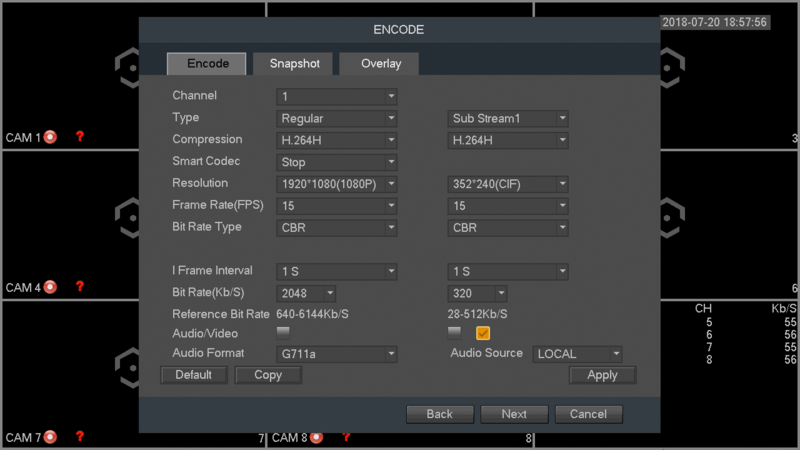 This is where you can adjust the video quality settings for your DVR/cameras, including the compression and frame rate. 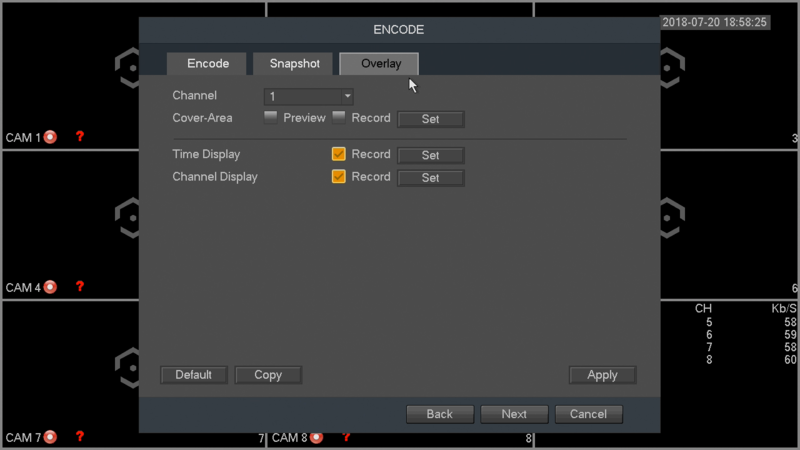 When you have finished configuring your encode settings, click Apply and then the Next button to continue. The next screen that will appear will be the Snapshot settings screen. This is where you can adjust the settings for your snapshots. This includes, the image size, quality, as well as interval in which the snapshot is retained. Once set, click Apply and then the Next button to continue. The next screen that will appear will be the Overlay settings screen. This is where you can change overlay settings for each channel. This includes, channel numbers, time displays, and channel titles. Once set, click Apply and then the Next button to continue. This option allows you to configure the settings for an installed hard drive. For example, you can set settings for when the hard drive is full, you can set the file length and time of a recorded video, or setup auto-delete to auto delete old files from the system. For more information on the settings listed in this menu, refer to the table below. HDD Full Configure the settings for the situation when all the read/write HDDs are full. 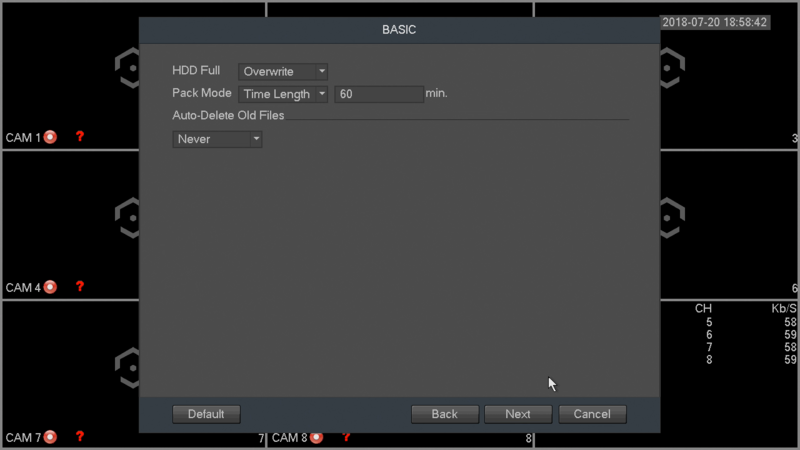 Pack Mode Configure the time length and file length for each recorded video. Auto-Delete Old Files Configure whether to delete the old files and if yes, in the Auto-Delete Old Files list, select Customized to configure the time length for how long you want to keep the old files. The next screen you see is the Schedule screen. Your DVR is configured, by default, to record everything on all channels 24/7 (this will only actually happen provided you have a hard drive installed). You can also use this screen to set up motion detection and alarm schedules. Once you are satisfied with the settings on this screen, click the Apply button. Next, you will be able to configure your snapshot settings for your scheduled recordings. 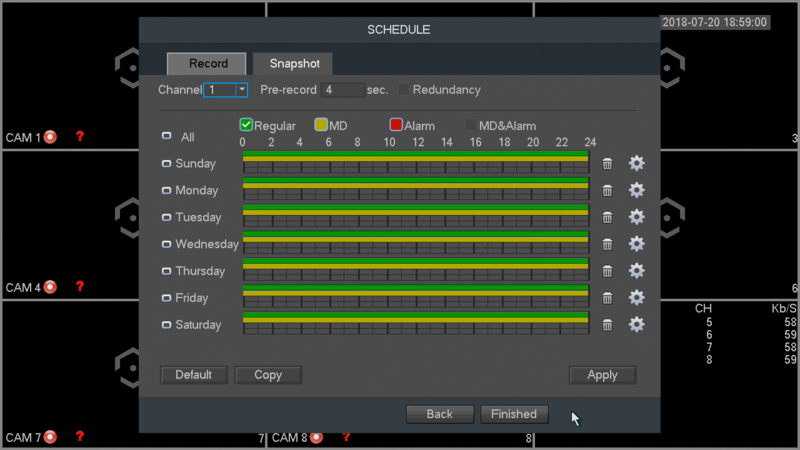 You can also use this screen to set up motion detection and alarm schedules for snapshot events. Once you have scheduled your events, click on the Finished button to continue. Click OK to continue and the next screen you will reach will be the home video wall screen for your system.